That’s the shorthand nickname by which we referred to our Procedures Manual. Its official name for most of my career was FAA Handbook 7110.65-latest revision, Air Traffic Procedures. I have a couple of minor rants in regard to the ATP I’ve wanted to get off my chest, and as my well of Tales seems to be running a little dry, you get to enjoy this one. The manual in use when I hired in, was one of three manuals used by the FAA for their ATCS (Air Traffic Control Specialist) facilities. The Tower option (both upstairs look-out-the-window facilities and approach controls) used the FAAH 7110.8. In it were all the procedures tower folks used in their worlds. Many of them were congruent with some of ours (I’ll get to that). In the Center option we used FAAH 7110.9. It, too had all the procedures we used in our world, including some that were common to approach controls. All IFR operations were in both. Centers live and breathe IFR, but towers also have a lot of stuff like landing clearances, visual separation minima, etc., which we center folks don’t (can’t) use, as we don’t have runways in the center. The oddity of the bunch was the FSS (Flight Service Station) option, the third of the triumverate, and whose manual was FAAH 7110.10. Why oddity? FSSes don’t perform any “control” functions. They do a lot of advisory stuff, most of it critical to the National Airspace System, but they don’t separate airplanes. Back in the old days, they handled a large part of the communications workload between the centers and the airplanes before we got direct air-to-ground capabilities (much of it in the consolidation and modernization of centers in the early ’60s), but in all cases, they relayed clearances, they didn’t formulate them. Anyway, we’ll only consider the tower and center options (the .8 and .9 manuals) in this discussion, the reason for which will become obvious presently. Some of the subject areas in ATC which were covered were runway operations, IFR operations, Oceanic procedures, vectoring, radar procedures, etc. While it may not be obvious, centers had no need whatsoever for information on runway procedures. Similarly, towers didn’t need to know how to do oceanic. Heck, for that matter, thirteen of twenty centers didn’t need to know how to do oceanic. So it wasn’t all that odd to have separate manuals for the separate options. For the sake of argument, let’s make some assumptions (because I don’t know how to get qualitative data for some of the quantitative content). There are many more center controllers than there are tower controllers—probably something like 8,000 compared to 5,000. Assume a manual comprising 300 pages (for either option—it’s just an example)—in the .9, or center manual, there might have been 20 pages on oceanic procedures, and another couple on pressure suit flights or other high altitude operations and maybe another couple on aerial refueling. The .8, or tower manual might have 20 pages on runway separation and definitions of aircraft types with separation minima for each. Sounds reasonable, doesn’t it? Net result? 13,000 manuals each 340 pages long in the new system (renamed FAAH 7110.65). This was done in an era of paperwork reduction. And you can probably add several thousand manuals for the various training departments, procedures departments, and quality assurance departments for each facility. Let’s round off to 20,000 manuals, total. At 40 additional pages each, that’s nearly a million unnecessary pages of paper distribution. I could never wrap my head around the necessity of >8,000 manuals with utterly irrelavent runway separation pages being stocked in the twenty ARTCCs around the country. I’ll bet the person who proposed this change got an award. Now, for the naysayers, the actual numbers (whether it’s the ATC numbers or the number of pages) don’t matter—the principle is the same, regardless. And in fairness, the change was made before computers were ubiquitous. Today, a geeky twelve year old could easily develop and maintain a database of all ATC paragraphs with a field denoting whether they applied solely to tower option, center option, or both, and produce a manual with the stroke of a few keys which would be unique to either. That way, each paragraph would have the same designation regardless of which option’s manual was being produced. That would be paperwork reduction. The .10, FSS manual (containing pilot briefing procedures, among other unique FSS operations) was mercifully not incorporated in this project. That would have been really stupid. Unlike the other two options, there wasn’t much in the .10 that was the same as in the other two. After all, FSSes don’t apply separation. Phraseology would have been about it. All the rest would be about weather observations, pilot briefings, and flight plans. Imagine (if you follow the logic path) incorporating all of the .10 into our new manual. * By the time I retired, there were people sitting beside me controlling traffic who hadn’t even been born when I hired in. Some of them would argue with me that ANC stood for Army Navy Coast Guard. They’d never seen one, the manuals were long gone before they were born, and despite that their idea didn’t even make sense (especially given the time when the ANC manual would have first been produced—immediately post WWII) they still vociferously propagated the notion. They would not accept that I’d actually had my hands on one and had a little better notion than they of what it stood for. Nevertheless, it’s very hard to prove, as internet searches on the string “anc” yield a lot of hits regarding Anchorage, Alaska, whose airport identifier is ANC. 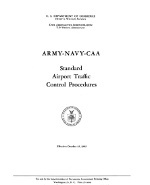 Even old legal citations are inconsistent, with “Army Navy Coast Guard CAA” and “Army Navy Air Force CAA” being variations (obviously incorrect) observed. Update! May 2011: One of my fans, a genuine dinosaur controller who probably actually knew Archie League, sent me an image of an old ANC manual (I think the cover date is 1951). Further Update—December 2011: One of my local friends, also a dinosaur, loaned me his Annual Directory from the Society of Aviation Pioneers in which an article, by a controller who worked in the long defunct El Paso ARTCC, wrote of the procedures manual they were using in 1946. He said, "[at the time] there were as many as three established minimum altitudes for each airway segment...One for the Army (no Air Force for a couple more years), one for the Navy (which included the Coast Guard from 1941 until 1946) and one for civil operators. 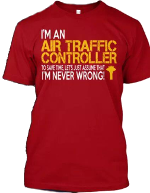 ...[T]he control of air traffic was in accordance with the rules and procedures spelled out in a publication named ANC-PCAT (Army, Navy, Civil—Procedures for the Control of Air Traffic)." I also finally found a better image of an older manual—1948. Given the cites above, it’s obvious to me that it would be hard to get Army Navy Coast Guard from the historical record. While not so obvious as I remembered, it seems clear that Army, Navy, Civil is the more correct abbreviation for all those affected agencies, even with Coast Guard listed. 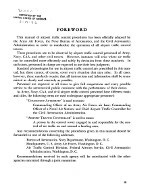 Absent an image of an actual pre-National Security Act of 1947 manual (the Act created the Air Force, although the actual service was not legislated until the Air Force Organization Act of 1951), it makes perfect sense. The rookies are just wrong. Chalk one up for the dinosaurs! Final Update! A recent journey into the depths of the web hit the mother lode. I found a reference to a 1945 version of the ANC manual, and the proof is there, in bold print, right on the cover. As you can see, it says “Army-Navy-CAA”. 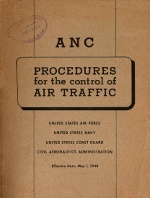 Refinements in its scope as the Air Force was created and an air arm of the Coast Guard developed, caused ambiguity in the title in later editions, as described above, but this one is clear and it cannot be in question that it serves as the origin of “ANC”. Even though the manual is entitled Standard Airport Traffic Control Proceders and not the PCAT title referenced above, the genesis of the originating agency is clear and was almost certainly carried over subsequent publications. With the effective date of 1945, this predated the creation of the separate Air Force. Being only one month post Japanese surrender, the Coast Guard was almost certainly still operating under the aegis of the Navy, such transfer of command being the procedure during wartime. I also copied the Forward page which amplifies and reinforces my deduction. At the end of the day, as was usually the case in arguments about the ATP (or ANC), I was, after all, right…just like the T-shirt says.